Our custom process starts by helping you choose the containers and plants that work best for your landscape, and that provide lasting beauty while enabling you to express your personal style. 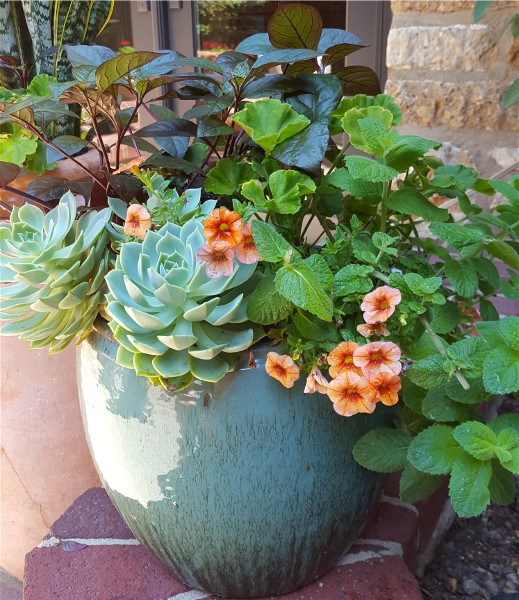 Containers come in many different shapes, styles, colors and materials, and we can either plant existing pots or help you choose new ones to suit your taste, weather exposure and budget. For planting, we use a premium-grade, sterilized potting mix, supplemented by a special slow-release fertilizer, to ensure proper drainage and promote plant health. We carefully choose our suppliers and select only the highest quality zone-appropriate plants available. Whether your goal is to achieve lush, healthy foliage, brilliant color or interesting texture – or any combination of all three – we go to great lengths to ensure your complete satisfaction. Our plant therapists typically make biweekly visits to your home to keep your planters looking their best all season long. Regular visits include trimming and shaping to maintain an ideal appearance; ‘deadheading’ to remove spent flowers; inspections and spraying to manage pests and disease; and supplemental fertilizing to keep your plants strong and vibrant. I love that you’re so helpful and conscientious about making sure my plants are cared for and my home looks beautiful all year around! –Marian T.